Cancer treatment has undergone a paradigm shift in today’s era, wherein through genomics intervention, targeted and personalized therapy approaches have gained popularity to ensure greater benefit for the affected. Targeted therapies have dramatically changed the way cancer patients were and are being treated through the past decade till today. The use of tumor tissues for genomic profiling, often provides only a snapshot; apart from the difficulty in obtaining them. Other factors like tumor heterogeneity, clonal evolution and selection contribute towards acquirement of tumor resistance towards systematic treatment. The need to identify an equally efficient yet a costeffective and rapid biomarker, initiated the use of cell-free circulating tumor DNA (ctDNA) as a potential surrogate marker. The current review is directed towards exploring the diagnostic, prognostic as well as predictive potential of ctDNA (liquid biopsy) in cancer. All biological and technical aspects covering recent advances pertaining to analytical sensitivity and accuracy have been put forth. In spite of the big promise ctDNA holds, its routine use for clinical application is still not widespread. Requirement to harmonize the pre-analytical and analytical processes along with setting up of standards to validate the role of liquid biopsy as an efficient clinical marker is the need. Efficient cancer treatment revolves around the ability to identify molecular events which underlie pathogenesis and with the support of genomic analysis; therapies tailored as per the genetic composition of the tumors have led to significant improvement in therapy outcome. Tumor profiling or gene expression profiling is one popular method which aids in driving clinical decisions and also identifies responders for various drugs through tumor categorization. Identification of reliable markers hence becomes a necessity to not only improve early diagnosis, but to also gain guidance on therapeutic choices and also monitor treatment response. In this regards, The National Comprehensive Cancer Network (NCCN), this is an alliance of 27 cancer centres in the United States, issues guidelines which aids in advancing quality, efficacy and effectiveness of cancer care. The NCCN Clinical Practice Guidelines in Oncology for Non-Small Cell Lung Cancer (NSCLC) has been updated (version 4.2018) to include new treatment options, recommendations, etc. Even for metastatic disease, the NCCN NSCLC guidelines strongly recommends a broad molecular profiling as a necessity to identify rare driver mutations which will aid in identifying best suited therapeutic agents as well as to identify appropriate on-going clinical trials which may prove of benefit for the patient (NCCN v1.2015). The liquid biopsy agents; circulating tumor cell (CTC) and ctDNA have been deemed to prove very beneficial in this regards. They also provide a great support to overcome the drawbacks associated with solid biopsy, wherein apart from being invasive, it does not even stand to truly reflect the current tumor dynamics as well as treatment sensitivity . Though CTCs have also been studied as a broad prognostic factor for cancers of the breast, prostate and colorectal, their role in other cancer types remains to be explored. However, early detection of CTCs have been postulated to be useful in identifying increased risk of metastasis providing opportunity to devise a customized adjuvant therapy in patients harboring operable or locally advanced disease. Characterization of CTCs has also been shown to aid in deciphering the metastatic process and identification of new treatment targets. The nuclear material, deoxyribonucleic acid (DNA) can be enclosed within the nucleus of a cell or may also be cell-free (cfDNA). The credit for detecting the presence of circulating nucleic acids in serum in the year 1948, has been associated with two French biochemists. Under physiological conditions, the generation of cfDNA which are approximately anywhere between 70- 200bp long in size occurs from the apoptotic and necrotic cells. Though the exact biological mechanism remains to be elucidated, recent studies have described deriving cfDNA from bone-marrow and liver of healthy individuals. With a short half-life ranging between 15 min to few hours, the cfDNA is rapidly cleared by the liver and kidney. Cancerous cells also release fragments of DNA in circulation due to their high turnover which is ctDNA, which can be easily distinguished from cfDNA due to presence of cancerrelated mutations, as the former is released from the tumor (Figure 1). Devising a methodology to harvest and analyze this ctDNA presents a less-invasive approach to address various aspects of the cancer diagnosis as well as treatment. Based on the concept of “liquid biopsy”, various hurdles pertaining to tumor heterogeneity as well as monitoring of chemotherapy-resistant mutations becomes a possibility [2-4]. The load of ctDNA fraction has been detected to be extremely variable ranging from 0.01% to more than 50% of the cfDNA and many studies have identified a high level of concordance between mutations in ctDNA and matched tumor mutations and have also positively correlated ctDNA levels to tumor burden. Since, ctDNA is believed to be released from tumors and is also found to be resistant to the impact of intratumor heterogeneity, liquid biopsy holds the promise to enable detection of the whole spectrum of cancer mutations in a given patient apart from holding the other benefit of being less-invasive. Figure 1: ctDNA fragments releasing from cancerous cells. This technique utilizes antibodies directed against cell surface markers, wherein positive immune-selection specifically utilizes antibodies directed against cancerous cell surface markers. EpCAM or epithelial cell adhesion molecule is commonly used for positive immune-selection in most CTC detections. On the other end, techniques for negative selection are also available, which involves depletion of leukocytes and use of CD45-binding antibodies. This involves CTC isolation based on physical attributes like cell size or bioelectric features as most of them exhibit larger size show different density, electromagnetic charge as well as motility in comparison to normal blood cells. By use of technologies like electrophoresis, filters, or microfluidic chip, their separation can be easily achieved. Post enrichment, detection of CTCs can be achieved by genomic, proteomic or transcriptomic approach. Cytological approach with utilizes examination of stained cells for morphological examination is still touted to be the gold-standard for CTC detection. One technique worth discussing in this review is the cell research which is a combination of the EpCAM-based enrichment followed by immunocytofluorescence for detection. It identifies and enumerates CTCs as per expression of epithelial cytokeratins, absence of CD45 staining and presence of nucleus. This test has also been approved by the US FDA for use in management of metastatic breast, colorectal and prostate cancers. The third detection approach involves retrieving cancer-specific mutations, typically KRAS in DNA of enriched cells. This aids in demonstrating with 100% specificity theoretically that the isolated CTCs are clonally related to the primary tumour. However, these mutation based techniques are laborious and time-consuming requiring single cell analysis, making them unfavourable for clinical use. Thus, there is abundance of literature pertaining to isolation of CTCs in localized disease conditions using various techniques wherein detection rates range from 10-80% depending on the technique used as well as stage of the disease. The use of liquid biopsy though has abundance of benefits attached to it, its detection and the quantity detectable in blood is influenced by tumor burden and type along with other potential mechanisms. Also, the time of detecting the presence of ctDNA largely depends on stage of cancer progression; with studies indicating positive detection during cancer progression rather than during response to systemic therapy (early detection of cancer can be highlighted). Studies reveal that ctDNA was effectively detected in 82% to 100% of patients with stage IV disease of colorectal cancer as compared to 47% of patients with stage I disease. However, ctDNA based detection technique yielded an average of 5 months earlier prediction of disease than conventional radiographic imaging in breast cancer. Another significant role of ctDNA based liquid biopsy analysis is the therapeutic response analysis. A study on 53 patients with metastatic colorectal cancer receiving first-line chemotherapy, A reduction of ctDNA levels were observed before cycle 2 which fairly correlated with radiographic response at 8 to 10 weeks proving to be a sensitive biomarker for disease response prediction than currently existing radiographic imaging techniques . Mosaicism and clonal expansion phenomena also play significant roles in cancer detection. Studies also indicate that the analysis of “cells of origin” indicated that the mutations detectable at the tissue level could be efficiently detected prior in the stem or progenitor cells . Though few studies have demonstrated the detection of ctDNA in patients with metastatic disease, the clinical utility of the same still remains to be evaluated [8,9]. Technologies available for detecting ctDNA are many which include allele-specific PCR, BEAMing (beads, emulsion, amplification, magnetics), droplet digital PCR, next-generation sequencing (NGS), etc. [10,11]. Of all the technologies, NGS ranks to be the gold-standard now because of its potential to detect a wide range of cancer-related gene mutations. A lot of factors have been deemed to affect ctDNA detection and of these the pre-analytical conditions have a critical bearing. Various aspects like volume of blood collected, contamination by healthy cellular DNA in the sampling tube, etc. affect sensitivity of ctDNA detection. Plasma thus is considered to be the most suitable for ctDNA detection, though the time lapse between blood draw and plasma separation if of critical importance here. The ideal processing time has been stated to be less than an hour and hence in order to make liquid biopsy based diagnostics feasibility in clinical set-ups, commercial sample collection tubes with specialized fixatives have been made available. This aid in sample storage for several days before processing. One of the techniques widely suggested for ctDNA detection involves targeting known mutations, which could be the highly recurrent ones like KRAS or ones which have been previously characterized on the tumor tissue or by specifically looking out for the de novo genetic alterations. Other technique involves a PCR-based approach for detection and quantification of a minority of mutated alleles in the background of normal DNA wherein high levels of sensitivity become achievable presenting the possibility to detect up to 1 mutated allele out of 100,000 normal alleles. Techniques like droplet digital PCR, BEAMing have been touted to be the most promising approach for detection of highly recurrent hotspot mutations with high sensitivity. For e.g. : A sensitivity and specificity of ~95% and ~99% has been associated with detection of KRAS mutations in colorectal cancer not pre-exposed to anti-EGFR drugs. The copy number variations were precisely established in 34.4% (n=32) of stage IV colorectal carcinoma patients from plasma DNA. The detection rate from plasma DNA was concordant with those observed in the primary tumor and CTCs thus proving the efficacy of a non-invasive liquid biopsy based cancer detection. The study also proves that the detection of copy number alterations from the first plasma sample after 2 years and 3 months of the disease in colorectal cancer patient was almost identical to those of the primary tumor . At the other contrast spectrum lies a technology like NGS which enables study of several genes and identification of tumor ctDNA genetic lesions without prior knowledge of the genotype of the tumor. This provides landscape of mutations along with highlighting the new emergent variations that could have a possible role in drug resistance or disease progression. However, the sensitivity of NGS-based techniques have been detected to be low in comparison to droplet dPCR, while technologically the modified ultrasensitive NGS approaches like SafeSeq, CAPP-Seq, etc. though have exhibited a sensitivity of at least 0.1%, known as limit of detection have emerged to be too complex for routine clinical laboratory use. A significant clinical actionability lies in the attribute of early detection of cancer with detection of ctDNA from liquid biopsy samples. This is continuously evidenced in multiple studies, citing an example where the assay proved a sensitivity and specificity of 90% and 100% respectively in the detection of DNA mutations in plasma of early stage breast cancer patients with minimal clinical presentation . The current standard-of-care in the Unites States for cancer diagnosis and treatment planning, monitoring drug therapy and resistance along with devising alternate strategies involves evaluation for somatic mutations. With lung cancer being the leading cause of death in the US, followed by cancers of the breast and colon in women and prostate and colon in men, strategies planned on a genomic landscape promise better therapeutic deliverance . A rise in the number of melanoma cancers has also been reported. The methodology commonly adopted for somatic mutation analysis involves use of liquid biopsy wherein measurement of cfDNA or more specifically ctDNA from plasma is done instead of tumor tissue obtained through biopsy or fine-needle aspiration. This non-invasive method is highly sensitive and also presents high specificity for detection of somatic mutations in various cancers [2-4,10]. ctDNA evaluation has also been correlated with clinical and radiological outcome and also provides aid in predicting overall survival of patients in some cases [8,9,11,15,16]. Additionally, in several cancer types, serial evaluation of ctDNA has been shown to be beneficial in tracking disease progression as well as identifying appearance of additional somatic mutations which may be associated with drug sensitivity as well as resistance [17-20]. ctDNA mutation analysis has also shown promising results towards screening and identification of individuals predisposed for higher risk of developing colorectal cancer detailed in a recent study by Perrone et al. . In clinical setup, another aspect plays a key role in deciphering efficacy which is the turnaround time. This aspect in oncology is more of a concern to be addressed as time is a crucial factor in determining medical outcome. A recent study which analyzed the accuracy of liquid biopsy based test to detect key genetic mutations in a common form of lung cancer, showed data from liquid biopsies to be delivered more quickly in comparison to those from tissue biopsy. The median turnaround time for liquid biopsy was detected to be three days as compared to 12 days in case of tissue biopsy. This report also highlights the high rate of accuracy to be associated with this rapid plasma genotyping based test wherein the predictive value for newly diagnosed patients from plasma ddPCR was 100% for primary EGFR and KRAS mutations . A tissue biopsy generally provides insight only on a part of the whole tumor and hence may miss harboring some key variations present elsewhere in the tumor. On the other hand, liquid biopsy better reflects the distribution of mutations in the whole of tumor. Clinical trials on hotspot mutations in key genes which drive cancer have shown these mutations to reflect tumor burden, treatment response and resistance as well as disease prognosis. The frequently tested genes include BRAF, EGFR, NRAS, KRAS, FOXL2, TP53, PIK3CA, etc. implicated in a variety of cancer types like melanoma, cancers of the lung, colon, breast, etc. Majority of these somatic mutations have been deemed to be activating mutations, wherein they increase the activity of the protein which leads to the continuous release of growth signals, thereby increasing cell proliferation contributing towards formation of tumor. Many studies have been published connecting identification of key cancer driving mutations in many different cancer types. Few literature data has been cited in this review to highlight the significance of ctDNA based diagnosis as well as to discuss the landscape of possibilities published in this regard. A recent study by Olsson et al. , highlighted ctDNA based detection to precede clinical detection of metastasis in 86% of the patients and also stated its quantity being predictive of poor survival. On the other hand, the study also stated the nondetectability of ctDNA postoperatively in case of long term disease-free surviving patients . Another study which worked on mutation tracking in ctDNA to predict relapse in early breast cancer identified, postoperative ctDNA levels in plasma proved to be a predictor for metastatic relapse with high levels of accuracy . In case of the PIK3CA gene, which encodes for a protein involved in phosphorylation of signalling molecules, many studies have detected mutations in ctDNA. A study by Dawson et al. , identified PIK3CA mutations in ctDNA of 97% patients with metastatic breast cancer. Also, the mutation levels in ctDNA provided insight on early treatment response in 53% women. A follow-up for a period of ~100 days also detected increased levels of ctDNA to be associated with poor survival outcome . Another study on PIK3CA mutations in ctDNA, identified mutations in 22.7% of patients in stage I-III. Patients with high levels of PIK3CA mutations also exhibited short recurrence-free survival as well as overall survival in comparison to patients harboring low or no ctDNA mutations . Another popular candidate gene pertaining to breast cancer is the tumor suppressor TP53. A study by Madic et al. identified TP53 mutations in ctDNA in 81% of triple negative breast cancer patients. The levels of ctDNA were also detected to bear no prognostic impact on time to progression or overall survival. A study by Olsson E, et al. highlighted identification of ctDNA mutations in TP53 in 20 invasive breast cancer patients all of whom developed metastasis during the follow-up phase. Apart from being beneficial in recurrence prediction, occult metastasis identification was also done in 86% patients prior to development of clinical evidence of the disease . Melanoma or skin cancer which develops from the melanocytes has shown increased prevalence in recent times world over. The only current clinical test available to identify metastasis, is measuring levels of serum lactate dehydrogenase (LDH). Though, increased levels are correlated with higher disease burden, it is a non-specific biomarker and has been linked to many malignancies. On the clinical front, though targeted and immunotherapy options are available, reliable markers to identify early recurrent disease as well as to predict treatment response is unavailable. To overcome this hurdle, many studies have evaluated the benefit of liquid biopsy ctDNA to assess real-time measurement of disease status as well as therapy response . Many scientific publications show sensitivity of ctDNA mutations in melanoma. A study by Sanmamed et al. , highlighted the quantification of ctBRAF V600E mutation to be beneficial in follow-up for treatment response in advanced melanoma patients. This study reported the agreement between BRAF mutations in tumor tissue and ctDNA to be 84.3%. Also, the baseline ctBRAF correlated well with tumor burden and in disease progression state, a significant lowering in the concentration of ctBRAF V600E was noted compared with the best response. Another study by Ascierto et al. , ascertained cfDNA to be a beneficial prognostic as well as response marker in clinically active metastatic melanoma patients treated with dabrafenib. The overall agreement between BRAF V600E mutation in tumor tissue and cfDNA was detected to be 84%, while that for V600K was detected to be higher at 97% respectively. For BRAF V600E and V600K, the sensitivity detected was 79% and 89%, while the assay specificity was detected to be 100% and 99% respectively. Also, a statistically significant correlation was detected between the baseline cfDNA BRAF V600E mutation levels and overall response rate . A report by Lipson et al. studied real-time analysis of ctDNA for monitoring tumor burden in melanoma patients being treated with immune checkpoint blockade. This report concluded the levels of ctDNA to correlate well with clinical and radiological outcomes. In few cases, increasing levels of ctDNA was also detected to be correlating with disease progression analyzed by radiography. This report also highlights two crucial understandings; one being decreasing levels of ctDNA detected during clinical or radiographic disease progression might aid in identifying patients who would show therapeutic response and secondly increasing levels of ctDNA between radiologic examinations might aid clinicians to consider early radiologic re-staging as it could indicate true disease . Lung cancer continues to be the leading cause of cancer-related deaths world over only due to delayed diagnosis. This inability for early detection is also partially contributed by unavailability of an ideal early diagnostic method. DNA methylation identification has been postulated to be a necessity for early diagnosis . A report on this regards by Salazar et al. reported correlation between CHFR (Checkpoint with Forkhead and Ring Finger domains) methylation status and results of second-line chemotherapy in 179 of 366 patients. The epidermal growth factor receptor (EGFR) plays a crucial role in triggering several signal transduction cascades and mutations in the same have been linked to lung cancer. Mutations in EGFR as well as gene amplification status have been deemed to be crucial in determining tumor response towards tyrosine kinase inhibitors . A study by Karachaliou et al. analyzed the association between the EGFR L858R mutation in cfDNA and survival in patients treated with erlotinib as first-line therapy in patients affected by non-small cell lung cancer (NSCLC) and harboring EGFR mutations in the tumor tissue. EGFR mutations in cfDNA was detected in 78% of the stage IIIB+IV patients, wherein the median overall survival was lower in those harboring the cfDNA L858R mutation in comparison to those having the exon 19 deletion. This study concluded the cfDNA L858R to be a good surrogate prognostic marker. The sensitivity and specificity of this assay was detected to be 78% and 100%, respectively . Another report by Mok et al. analyzed EGFR mutations in ctDNA as a predictor of survival outcome in NSCLC patients treated with first-line intercalated erlotinib and chemotherapy. This study concluded blood-based EGFR mutation analysis to be relatively sensitive and highly specific wherein dynamic changes in cfDNA EGFR mutation becomes a very good predictor for clinical outcome. The overall concordance between mutation analysis in tissue and blood was detected to be 88%, while the sensitivity and specificity of the blood based test was detected to be 75% and 96%, respectively . A report by Qiu et al. concluded ctDNA to be effective for detection of EGFR mutations in NSCLC wherein liquid biopsy can play a key role in personalized cancer therapy for the same . A study by Oxnard GR, et al. , identified liquid biopsy based testing to be effective in assessment of response and resistance in NSCLC and also provides aid in detection of resistance mutations as early as 16 weeks before radiographic progression. Another study by Dowler Nygaard et al. , analyzed levels of KRAS cfDNA mutations during treatment of advanced NSCLC. This study detected median quantity of cfDNA to be significantly higher during progression (9250 alleles/ml) than baseline at 5450 alleles/ml. Also, overall and progression-free survival. Were detected to be significantly shorter in patients with high levels of cfDNA. Clinically, poor prognosis was associated with high baseline levels of cfDNA . A study by Newman et al. , implemented the deep sequencing method; CAPP-Seq (cancer personalized profiling by deep sequencing) to quantitate ctDNA with broad patient coverage. This technique which was designed in NSCLC to cover multiple classes of somatic alterations identified mutations in >95% tumors. Also, 100% ctDNA was detected in stage II-IV NSCLC patients and 50% in stage I patients with a specificity of 96% for the mutant alleles. High correlation has also been reported between levels of ctDNA and tumor volume and thus distinguished imaging changes between treatment-related and residual disease . The use of ctDNA based liquid biopsy approaches in case of colorectal cancer have been published, wherein its levels have been reported to be detected in >75% of patients with advanced colorectal, bladder, ovarian, pancreatic cancers, etc. . In publications pertaining to ctDNA in colorectal cancer, one report by Lin et al. , analyzed the clinical relevance of alterations in levels of circulating plasma DNA (cpDNA) in colorectal cancer patients based on mutation spectra in primary tumors. This study detected a steady rise in median levels of cpDNA from 4300 copies/ml in stage I to 13000 copies/ml in stage IV. The sensitivity of cpDNA mutations was also calculated to be 24% in stage I, 45% in stage II, 27.3% in stage III and 87.5% in stage IV, respectively. A better 5 years overall survival was also noted for patients with low cpDNA . A study by Morelli et al. , reported on characterization of clonal selection in ctDNA from CRC patients refractory to anti-EGFR treatment. Sequencing ctDNA analysis in this study identified new EGFR and KRAS mutations and also highlighted the importance of monitoring treatment-induced genetic alterations to aid in identification of markers for screening treatment efficacy in anti-EGFR-refractory patients . Another study which evaluated a novel high-sensitivity multiplexed mutation detection platform; SCODA (sequence-specific synchronous coefficient of drag alteration) which enriches mutant DNA to achieve high sensitivity and specificity, highlighted this method to be highly beneficial in mutation profiling and quantitation of ctDNA. The overall concordance in mutations detected between tumor and plasma ctDNA was detected to be 93% for metastatic cases and 54% in non-metastatic patients. Additional mutations were also detected in the ctDNA not present in tumor, in three cases in this study. Also, this study demonstrated ctDNA analysis to be better in anticipating tumor recurrence in patients undergoing liver metastatectomy earlier than the biochemical marker carcinoembryonic antigen (CEA) or imaging . A study by Spindler et al. , investigated levels of total cfDNA in CRC patients undergoing second-line chemotherapy as well as healthy controls. The levels of cfDNA was detected to be significantly higher in CRC patients (6000 alleles/ml) in comparison to controls (2400 alleles/ml), and such patients with high levels of cfDNA exhibited shorter survival from irinotecan compared to ones who exhibited low levels of the same. This study concluded cfDNA to be an important aspect to predict outcome of chemotherapy in metastatic CRC and a combined marker analysis with KRAS was detected to further add a consistent prognostic effect, in samples drawn at time of progression . A recent study by Reinert et al. which presented ctDNA load as an indicator of disease burden among patients post-surgery for CRC, detected ctDNA assessment to be highly specific as well as sensitive for monitoring disease load, as well as to provide clinically relevant lead times. The ctDNA analysis in this study identified relapse in all the 6/6 relapsing patients as well as 0/5 in the non-relapsing cases, highlighting a sensitivity and specificity of 100%, while CEA analysis identified relapse in 4/6 relapsing patients and 0/5 in non-relapsing cases, yielding a sensitivity and specificity of 67% and 100%, respectively . A study by Tabernero et al. used BEAMing technology to identify variations in KRAS, PIK3CA, and BRAF mutations to predict clinical activity of regorafenib in patients with metastatic CRC. ctDNA tumor associated mutations were detected in 69% of patients for KRAS, 17% of the patients for PIK3CA and 3% of the patients for BRAF. This report concluded BEAMing of ctDNA to be a good approach for non-invasive analysis in real time for identification of clinically relevant mutations not detected in archival tissue. The overall concordance in detection of mutations between tumor samples and ctDNA was detected to be 76% for KRAS, 88% for PIK3CA and 97% for BRAF. The high discordance rate in KRAS was attributed to the finding of certain mutations in ctDNA which were not detected in the archival tumor sample. Also hot-spot mutation identified from both the source was found to be identical in 97% of the cases for KRAS and 94% for PIK3CA . Another report by Wong et al. analyzed the pharmacodynamic effects of regorafenib in metastatic CRC patients and to discover potential biomarkers involved in predicting clinical benefit through ctDNA. This study detected recurrent somatic mutations in certain genes like KRAS, PIK3CA and BRAF in ctDNA but not in the archival tumor tissue. Also, the total levels of cfDNA were found to be inversely correlated with progression-free survival and mutations in KRAS with shorter period of the same. This study concluded plasma cfDNA to be a potential predictive biomarker for regorafenib treatment response . High grade ovarian and endometrial cancers are one of the most lethal diagnosed female reproductive tract malignancies world over. Though the current strategies pertaining to diagnosis and treatment appear efficacious, widespread recurrence is seen in most cases within 18 months followed by death in many cases post recurrence within 5 years. The current plethora of tests pertaining to biomarker analysis and imaging do not prove to be effective in predicting initial therapy outcome . Many studies have therefore explored the efficacy of using ctDNA based tests to overcome the current hurdles. A study by Forshew et al. , showed the efficacy of identification and monitoring of cancer mutations by deep sequencing of ctDNA. This study which screened >5000 genomic bases for low-frequency mutations, identified the same with frequencies as low as 2% with a sensitivity and specificity of over 97%. Of the 62 samples analyzed using minute amounts of ctDNA for sizeable genomic stretches, a positive predictive value (PPV) of 100% was detected for mutations have allelic frequency of >2% with a sensitivity of 97.5%. Analysis of TP53 gene in patients with high levels of ctDNA led to detection of all the mutations in the same having allelic frequencies of between 2-65%. Similarly, a de novo mutation was also detected in the EGFR gene which was not detected in the tumor mass . Thus, the authors highlighted appropriate standardization of protocols pertaining to ctDNA analysis, will go a long way in making personalized genomics an amenable approach. Pancreatic ductal carcinoma continues to rank amongst one of the most lethal malignancies and the seventh leading cause of death world over. One of the major driving factors is unavailability of early detection tools as well as poor prognosis, wherein a 5th year survival rate has been detected to be just 4-7%. Though surgery is advised to be the most curative option available, it becomes applicable to only 15-20% of the patients with a non-metastatic localized disease. The four frequently mutated genes identified in this condition are KRAS, TP53, SMAD4 and CDKN2A . Many studies have documented the benefits of ctDNA based analysis to overcome many aspects of disease monitoring as well as treatment in case of pancreatic cancer. A recent report by Takai et al. , analyzed the clinical utility of ctDNA for molecular assessment and precision medicine in pancreatic cancer. This study analyzed KRAS mutational status in cfDNA using ddPCR and further performed targeted deep sequencing for KRAS variants identified on frequencies over >/=1% in patients. The ddPCR detected cfDNA KRAS mutations in 58.9% patients with inoperable tumors, while potentially targetable somatic mutations were identified by cfDNA sequencing in 29.2% of the patients. Also, the presence of KRAS mutations in cfDNA was significantly associated with poor overall survival. This study thus highlighted the significance of a combinational technical approach using cfDNA to prove beneficial for devising a clinical approach . Another comparison report by Kinugasa et al. , analyzed KRAS mutations in ctDNA as well as ultrasound-guided fine-needle aspiration biopsy tissue in patients with pancreatic cancer and presented the comparison results of survival rates. The KRAS mutation rates detected in the tissue sample and ctDNA was 74.7% and 62.6% and the concordance between the same was detected to be 77.3% . A recent study by Zill et al. analyzed the diagnostic accuracy of NGS based ctDNA analysis in patients affected by pancreatobiliary carcinoma. The ctDNA analysis detected 90.3% of the mutations detected in the tumor biopsy. Serial sampling study identified good correlation between changes in cfDNA with tumor marker dynamics. Also, for cfDNA sequencing methodology, the diagnostic accuracy was detected to be 97.7%, with a sensitivity and specificity of 92.3% and 100%, respectively. Thus, this report reiterated the benefits and safety of using cfDNA based analysis in case of pancreatic cancer, wherein tissue sampling is deemed to be unsafe or infeasible . Head and neck cancer is a heterogenous condition that generally arises from the mucosal epithelium in this region as well cells of the salivary gland and the thyroid. The most popular treatment methodology for squamous cell carcinoma involves surgical approaches as most of these exhibit general resistances to chemotherapy and radiotherapy. This condition is also deemed to be multifactorial with a high prevalence among Asians of the southern Chinese descent. Apart from analysis of viral markers as well as radiological assessment, genetic alterations in EGFR, FGFR, CCND1, PIK3CA, etc. are studied to identify therapeutic potential . A report by Wang et al. , analyzed the potential of ctDNA as a biomarker for HNC from plasma and saliva. In case of saliva, tumor DNA was detected in 100% of the patients with oral cancer, while in case of plasma, tumor DNA was detected in 80% of the oral cancer patients. Also, 100% of the oral cavity patients were detected to harbor detectable levels of tumor DNA in saliva. This study thus postulated saliva to an important source for tumor DNA enrichment in cases of oral cancer, while the plasma counterpart could be used for the other sites . Gastric cancer which is the third most common cause of deaths world over continues to pose a great challenge for treatment as majority cases are diagnosed only at the advanced stages of the disease. The imaging technology of computed tomography (CT) ranks to be the most popular tool for clinical management of this condition. However, disease recurrence prediction becomes difficult with CT. The use of cfDNA as an efficient diagnostic alternative has also been studied for colon cancer and few reports do exist in literature. A report by Hamakawa et al. , analyzed the potential of ctDNA as an efficient biomarker for gastric cancer. This study performed deep sequencing of cfDNA for TP53 mutations. Though the cfDNA levels did not correlate well with the disease course, its levels did reflect disease status . A liquid biopsy based test or rapid plasma genotyping involves analyzing the free-floating DNA from cancer cells for mutations. This technique provides a snapshot of important genetic variations which becomes crucial for identifying the molecular make up of different cancer types. Many reports have identified ctDNA based tests to have enormous potential in clinical settings as they are non-invasive as well as rapid in identifying common genetic fingerprints . This part of the review highlights the key genes which can be used as markers in ctDNA bases tests. The CTNNB1 gene encodes for an adherens junction protein; beta catenin critical for cell adhesion as well as for intercellular communication. It is also involved in the WNT signalling pathway that aids in cell division, growth as well as differentiation. A mutated CTNNB1 acts as an oncogene triggering development of cancerous cells and majority of these variations have been detected to be point mutations which cause aberrant WNT signaling as well as uncontrolled cell growth . CTNNB1 somatic mutations have been detected in different cancer types in varying levels like; 18% in endometrial cancer, 7% in pancreatic cancer, 6% in ovarian cancer, 3% in thyroid as well as prostate cancer . Mutations have also been reported in ~48% of colorectal cancers and about 3% in metastatic melanoma cases [56,57]. Studies have also highlighted the possibility of reversing drug resistance in gefitinib resistant NSCLC cell lines exhibiting overexpression of beta-catenin using siRNA based expression blocking . Published data also highlights the crucial role of beta-catenin in lung tumorigenesis wherein targeting of the same may provide novel strategies to overcome resistance to EGFR-TKIs. In case of transgenic mice exhibiting the EGFR-L858R-T790M, pharmacological inhibition of beta-catenin suppressed lung tumor growth while genetic deletion in the same showed dramatic reduction in lung tumor formation . The EGFR gene encodes for a cell surface glycoprotein, which is a member of the protein kinase superfamily involved in the binding of EGFR. This binding leads to dimerization followed by autophosphorylation of tyrosine, which culminates to cell proliferation, differentiation, cell cycle progression as well as increased cell invasiveness and apoptosis. EGFR somatic mutations have been detected in different cancer types in different levels like; 29% in lung cancer, 3% in prostate cancer and 2% in case of head and neck cancers . Exons 18-21 of the EGFR gene which encode for part of kinase domain have been documented to harbor most mutations. Deletion in exon 19 is the most frequently detected in about 40% of the cases, followed by the L858R in 36.2%, the T790M in about 3.8% cases and the exon 20 mutations in about 1.3% patients. NSCLC patients harboring EGFR mutations have been documented to be effectively treated using EGFR tyrosine kinase inhibitors (TKIs). Several clinical trials have demonstrated the efficacy of afatinib and erlotinib in patients harboring the exon 19 deletions as well as in those carrying the L858R mutation in exon 21. Colorectal cancer patients detected positive for the EGFR mutations and negative for the KRAS and NRAS codon 12/13 mutations are generally indicated for treatment with anti-EGFR-antibody; panitumumab . The most common mechanism involved in development of resistance among EGFR T790M positive - lung cancer patients treated with first generation TKIs is acquisition of a secondary mutation . The FOXL2 gene is a member of the forkhead winged helix family of transcription factors critical for granulosa cell development and contains a highly conserved DNA-binding forkhead domain . It is crucial for the normal development of granulosa cells and is highly expressed in the same. Moderate expression is also seen in the stromal cells, while it is completely absent in the oocytes. It is one of the earliest markers of ovarian differentiation and its expression persists well into adulthood. Somatic mutations in FOXL2 have been detected in varying levels in different cancer types like; 18% in ovarian cancers and 2% in testicular cancers . The granulosa cell tumors (GCTs), which are a subtype of ovarian and testicular cancer, account for less than 5% of all ovarian malignancies. A study by Shah et al. , which analyzed mutation of FOXL2 in GCTs of the ovary, identified the mutation load to be 97% in adult-type GCT, 10% in juvenile-type GCTs and 21% in the comas. The GNAS gene encodes for the alpha subunit of the stimulatory G protein (Gsα), which activates a cyclic 3’,5’-cyclic adenosine monophosphate (cAMP)-mediated intracellular cascade leading to cell growth and proliferation . Somatic mutations in GNAS have been detected in different cancer types in varying levels like; 9% in testicular cancer, 3% in thyroid cancer and about 2.3-9% in colorectal cancer [52,62]. The codon 201 mutations in GNAS have been reported in 67% of intrapapillary mucinous neoplasias (IPMN) of the pancreas as well as in 0.5-9% of colorectal cancers. In case of proximal colon cancer, GNAS mutations are often found to co-occur with KRAS and BRAF mutations . The KRAS gene encodes for a protein which is part of the RAS/RAF/MEK/MAPK signal transduction pathway downstream of the epidermal growth factor receptor (EGFR) and plays a key role in relaying signal for cell growth and differentiation . Abnormal KRAS protein is constitutively expressed leading to uncontrolled cell division and growth. Somatic mutations in the KRAS gene have been detected in different cancer types in varying levels like 57% in pancreatic cancer, 17% in lung cancer, 6% in gastric cancer, 2% in thyroid cancers, etc. . In 95% of the KRAS mutated cancers, mutations in codons 12 and 13 are frequently recorded in high frequency. As per NCCN (National Comprehensive Cancer Network) guidelines, testing for the KRAS codon 12 and 13 mutations is recommended for treatment of NSCLC and colorectal cancer prior to treatment by EGFR-inhibitors like Erbitux (cetuximab) or Vectibix (panitumumab). In case of BRAF V600-mutant melanoma, use of the MEK inhibitor, trametinib has been approved. Pertaining to strategies for targeting KRAS signalling, trametinib, along with other MEK inhibitors, either in single or combination therapy along with other multiple approaches are in clinical trials. Similar to KRAS, the NRAS gene plays a key role in the mitogen activation protein kinase (MAPK) pathway . The intrinsic GTPase activity in the encoded protein is activated by a guanine nucleotide-exchange factor and conversely inactivated by a GTPase activating protein. Somatic mutations in the NRAS gene have been detected in varying levels in different cancer types like; 18% in metastatic melanoma and 7% in thyroid cancers . Recent studies have also identified approximately 55% of colorectal cancer patients who bear oncogenic mutations in KRAS and NRAS exhibit resistance to EGFR-targeted monoclonal antibodies like cetuximab and panitumumab . The PIK3CA gene encodes for a member of the PI3K-PTEN-AKT pathway which regulates cell growth, proliferation as well as apoptosis and autophagy acting downstream to both EGFR and the RAS/RAF/MAPK pathways . All PIK3CA activating mutations result in release of activated PI3K protein culminating in abnormal cell proliferation. Somatic mutations in PIK3CA have been detected in different cancer types in varying levels like; 26% in breast cancer, 21% in endometrial cancer, 14% in colorectal cancer, and many more . In case of PIK3CA positive tumors, the PI3K inhibitor buparlisib has been shown to be promising in inhibiting the four isoforms of the protein. In order to determine treatment outcome and efficacy with anti-EGFR agents, status of PIK3CA along with that of KRAS, BRAF and NRAS is recommended to be determined . The TP53 gene encodes for a p53 protein which is a crucial tumor suppressor that regulates cell division by preventing DNA damage through agents like toxic chemicals, radiations, etc. . TP53 mutations have been largely associated with rendering the protein non-functional leading to uncontrolled cellular division. Somatic mutations in TP53 has been detected in different cancer types in different levels like; 46% in ovarian cancer, 45% in CRC, 33% in gastric cancer, 34% in lung cancer, 17% in endometrial cancer and many more . Studies have also documented an 81% concordance between tumor and plasma DNA analysis in triple negative breast cancer cases  Table 1. Table 1: Highlights the genes and frequency of mutations commonly found to be mutated among each cancer type. ALK is a tyrosine kinase receptor that induces phosphorylation of MAP (mitogen-activated protein) kinases and fuels PTN (pleiotrophin) binding induced MAPK pathway activation. Rearrangements in ALK are classified to be an important class of genetic alterations pertaining to NSCLC, as target agents like crizotinib and alectinib are designed and approved for the same. Conventionally detection of ALK rearrangements have been done by FISH or IHC in tissue and in case of NSCLC, obtaining sufficient quantity of the same continues to be a challenge. The introduction of the non-invasive liquid biopsy coupled with the emergence of NGS technology has resulted in development of a complimentary analysis technique and many studies have evaluated the performance of the same. A study published in 2017 which evaluated the ALK-rearrangements in NSCLC by liquid biopsy identified the specificity and sensitivity to be 100% and 89.3%, respectively . Another study which compared the detection rate of ALKrearrangements from circulating cells and tissue in NSCLC, showed a good agreement for EML4-ALK. This study identified five patients to exhibit ALK-rearranegement in CTCs as well as tumor samples, while ALK through FISH and IHC showed negative for both CTC and tumor tissue analysis in 82 patients . In case of ALK analysis, liquid biopsy has been touted to hold an advantage wherein detection can also be done among fragile patients to detect persistent ALK-rearrangement or even the ALK-resistant mutations to guide therapeutic recommendations. Also, liquid biopsy analysis has been shown to be effective for monitoring treatment outcome through crizotiniib or alectinib, wherein reemergence indicates lack of response or predict radiological progression . However, in case of ALK, there is still a pressing need to improve the sensitivity of liquid biopsy based tests. A recent report highlighting US FDA approval for ctDNA based testing in case of NSCLC for identification of patients harboring the EGFR T790M mutation to deem them eligible for treatment with a new T790M tyrosine kinase inhibitor (TKI) drug, highlights the extent of recognition this less discussed about liquid biopsy based testing has garnered. In the last one year, plethora of scientific publications has documented the benefit of this non-invasive biomarker in different cancer types pertaining to aspects of disease diagnosis, prognosis as well as monitoring of therapeutic efficacy. In case of genomic tests based on ctDNA, it generally reports for the presence or absence of those mutations whose levels are over 2 alleles/ml of mutant DNA in patient plasma. Generally, the input DNA levels refer to the amount of cfDNA enriched from the plasma of the patient for the assay. The reporting area generally covers total number of mutant copies of ctDNA and also percentage of mutant DNA relative to the input, with reference to the limit of detection (LOD). Apart from the measured technical factors, personalized interpretation of the result based upon clinical history as well as options for relevant clinical trials especially for patients with advanced disease stage may be provided. Cancer is a heterogenous disease majorly driven by somatic mutations in various driver genes. ctDNA based testing provides an efficient and non-invasive strategy to identify somatic cancer derived mutations in key cancer genes. With abundance in literature pointing the positives of liquid biopsy based genetic testing, it is imperative to note a few key pointers that can drive testing decision. Liquid biopsy though is an efficient genomics based test that aids clinicians identify many factors like plasma mutation tumor burden, disease monitoring, treatment strategies, as well as preventive surveillance in high risk cases of early detection; it is to be noted that ctDNA diagnostics is not meant for diagnosis of cancer, but rather as a screening tool for identifying possible malignancy as an adjunct to other existing medical examination procedures and interventions. Also, it is not designed to identify small tumors and will not detect all cancer types. Also, a negative result, wherein no mutations are detected does not eliminate the chance of presence of other genetic alterations as there are chances of involvement of genes not tested for in the ctDNA or there have also been reports indicating negative ctDNA based results attributed towards non-shedding of the mutated ctDNA in the blood by the cancerous cells. Interpretation of a positive test result also needs to be done after taking into account an individual’s clinical history, disease stage, therapeutic as well as imaging and other laboratory findings. These factors play a key role in decision driving and hence inaccuracy should be avoided at all costs. Other pre-analytical factors like improper blood sampling technique or handling can also contribute towards erroneous results. Ensuring appropriate counselling through a professional genetic counsellor or medical consultation is recommended for each test to garner patient confidence in understanding the report outcomes. Though, a lot has been analyzed and written upon on the benefits of liquid biopsy based testing in cancer, it needs to be understood that no test can replace the nuance of a physician’s examination, results of imaging technologies as well as tissue biopsies which have been considered as gold-standard for cancer diagnosis. Ma M, et al. Liquid biopsy - ctDNA detection with great potential and challenges. Ann Transl Med. 2015;3:235. Heitzer E, et al. Circulating tumor DNA as a liquid biopsy for cancer. Clin Chem. 2015;61:112-123. Lebofsky R, et al. Circulating tumor DNA as a non-invasive substitute to metastasis biopsy for tumor genotyping and personalized medicine in a prospective trial across all tumor types. Mol Oncol. 2015;9:783-790. Esposito A, et al. Monitoring tumor-derived cell-free DNA in patients with solid tumors: Clinical perspectives and research opportunities. Cancer Treat Rev. 2014;40:648-655. Hong B, et al. Detecting circulating tumor cells: current challenges and new trends. Theranostics. 2013;3:377-394. Komatsubara KM, et al. Circulating tumor DNA as a liquid biopsy: Current clinical applications and future directions. Oncology. 2017;31:618-627. Heitzer E, et al. The potential of liquid biopsies for the early detection of cancer. NPJ Precis Oncol. 2017;1:36. Heidary M, et al. The dynamic range of circulating tumor DNA in metastatic breast cancer. Breast Cancer Res. 2014;16: 421. Zill OA et al. Cell-free DNA next-generation sequencing in pancreatobiliary carcinomas. Cancer Discov. 2014;5:1040-1048. Diaz LA, et al. Liquid biopsies: Genotyping circulating tumor DNA. J Clin Oncol. 2014;32:579-586. Romero A, et al. Identification of E545K mutation in plasma from a PIK3CA wild-type metastatic breast cancer patient by array-based digital polymerase chain reaction: Circulating-free DNA a powerful tool for biomarker testing in advance disease. Transl Res. 2015;166:783-787. Heitzer E, et al. Non-invasive detection of genome-wide somatic copy number alterations by liquid biopsies. Mol Oncol. 2016;10:494-502. Mattos Arruda D, et al. Cell-free circulating tumour DNA as a liquid biopsy in breast cancer. Mol Oncol. 2016;10:464-474. Siegel RL, et al. Cancer statistics, 2015. CA Cancer J Clin. 2015;65:5-29. Janku F, et al. Actionable mutations in plasma cell-free DNA in patients with advanced cancers referred for experimental targeted therapies. Oncotarget. 2015;6:12809-12821. Ascierto PA, et al. Phase II trial (BREAK-2) of the BRAF inhibitor dabrafenib (GSK2118436) in patients with metastatic melanoma. J Clin Oncol. 2013;31:3205-3211. Oshiro C, et al. PIK3CA mutations in serum DNA are predictive of recurrence in primary breast cancer patients. Breast Cancer Res Treat. 2015;150:299-307. Madic J, et al. Circulating tumor DNA and circulating tumor cells in metastatic triple negative breast cancer patients. Int J Cancer. 2015;136:2158-2165. Olsson E, et al. Serial monitoring of circulating tumor DNA in patients with primary breast cancer for detection of occult metastatic disease. EMBO Mol Med. 2015;7:1034-1047. Tsao SC, et al. Monitoring response to therapy in melanoma by quantifying circulating tumor DNA with droplet digital PCR for BRAF and NRAS mutations. Sci Rep. 2015;5:11198. Perrone F, et al. Circulating free DNA in a screening program for early colorectal cancer detection. Tumor. 2014;100:115-121. Garcia-Murillas I, et al. Mutation tracking in circulating tumor DNA predicts relapse in early breast cancer. Sci Transl Med. 2015;7:302ra133. Dawson SJ, et al. 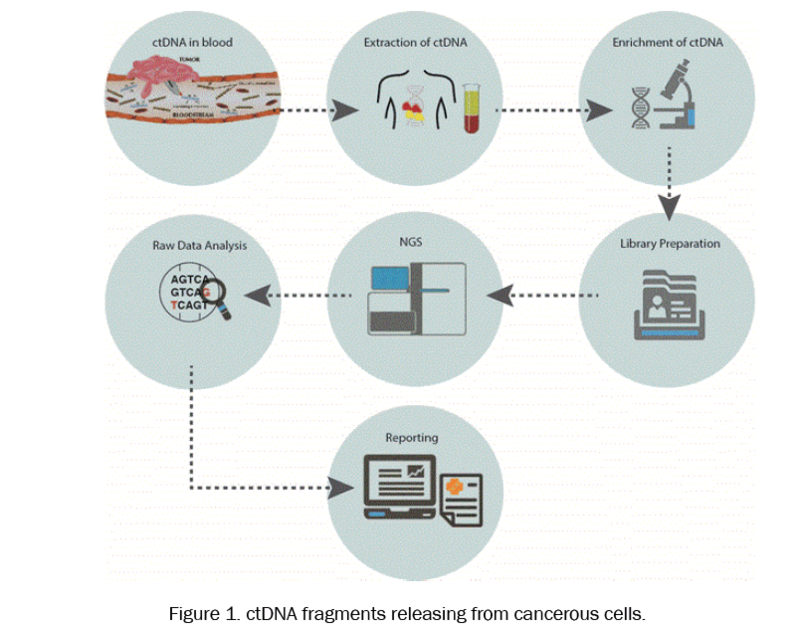 Analysis of circulating tumor DNA to monitor metastatic breast cancer. N Engl J Med. 2013;368:1199-1209. Sanmamed MF, et al. Quantitative cell-free circulating BRAFV600E mutation analysis by use of droplet digital PCR in the follow-up of patients with melanoma being treated with BRAF inhibitors. Clin Chem. 2015;61:297-304. Lipson EJ, et al. Circulating tumor DNA analysis as a real-time method for monitoring tumor burden in melanoma patients undergoing treatment with immune checkpoint blockade. J Immunother Cancer. 2015;2:42. Salazar F, et al. First-line therapy and methylation status of CHFR in serum influence outcome to chemotherapy versus EGFR tyrosine kinase inhibitors as second-line therapy in stage-IV non-small cell lung cancer patients. Lung Cancer. 2011;72:84-91. Bethune G, et al. Epidermal growth factor receptor (EGFR) in lung cancer: An overview and update. J Thorac Dis. 2010;2:48-51. Karachaliou N, et al. Association of EGFR L858R mutation in circulating free DNA with survival in the EURTAC trial. JAMA Oncol. 2015;1:149-157. Mok T, et al. Detection and dynamic changes of EGFR mutations from circulating tumor DNA as a predictor of survival outcomes in NSCLC patients treated with first-line intercalated erlotinib and chemotherapy. Clin Cancer Res. 2015;21:3196-3203. Qiu M, et al. Circulating tumor DNA is effective for the detection of EGFR mutation in non-small cell lung cancer: A meta-analysis. Cancer Epidemiol Biomarkers Prev. 2015;24:206-212. Oxnard GR, et al. Non-invasive detection of response and resistance in EGFR-mutant lung cancer using quantitative next-generation genotyping of cell-free plasma DNA. Clin Cancer Res. 2014;20:1698-1705. Dowler Nygaard A, et al. Levels of cell-free DNA and plasma KRAS during treatment of advanced NSCLC. Oncol Rep. 2014;31:969-974. Newman AM, et al. An ultrasensitive method for quantitating circulating tumor DNA with broad patient coverage. Nat Med. 2014;20:548-554. Bettegowda C, et al. Detection of circulating tumor DNA in early- and late-stage human malignancies. Sci Transl Med. 2014;6:224ra24. Lin JK, et al. Clinical relevance of alterations in quantity and quality of plasma DNA in colorectal cancer patients: Based on the mutation spectra detected in primary tumors. Ann Surg Oncol. 2014;4:680-686. Morelli MP, et al. Characterizing the patterns of clonal selection in circulating tumor DNA from patients with colorectal cancer refractory to anti-EGFR treatment. Ann Oncol. 2015;26:731-736. Kidess E, et al. Mutation profiling of tumor DNA from plasma and tumor tissue of colorectal cancer patients with a novel, high-sensitivity multiplexed mutation detection platform. Oncotarget. 2015;6:2549-2561. Spindler KL, et al. Cell-free DNA in healthy individuals, non-cancerous disease and strong prognostic value in colorectal cancer. Int J Cancer. 2014;135:2984-91. Reinert T, et al. Analysis of circulating tumour DNA to monitor disease burden following colorectal cancer surgery. Gut. 2016;65:625-634. Tabernero J, et al. Analysis of circulating DNA and protein biomarkers to predict the clinical activity of regorafenib and assess prognosis in patients with metastatic colorectal cancer: A retrospective, exploratory analysis of the CORRECT trial. Lancet Oncol. 2015;16:937-948. Wong AL, et al. Tumour pharmacodynamics and circulating cell free DNA in patients with refractory colorectal carcinoma treated with regorafenib. J Transl Med. 2015;13:57. Pereira E, et al. Personalized circulating tumor DNA biomarkers dynamically predict treatment response and survival in gynecologic cancers. PLoS One. 2015;10:e0145754. Forshew T, et al. Non-invasive identification and monitoring of cancer mutations by targeted deep sequencing of plasma DNA. Sci Transl Med. 2012;4:136-168. Takai E, et al. Clinical utility of circulating tumor DNA for molecular assessment in pancreatic cancer. Sci Rep. 2015;5:18425. Takai E, et al. Clinical utility of circulating tumor DNA for molecular assessment and precision medicine in pancreatic cancer. Adv Exp Med Biol. 2016;924:13-17. Kinugasa H, et al. Detection of K-ras gene mutation by liquid biopsy in patients with pancreatic cancer. Cancer. 2015;121:2271-2280. Kang H, et al. Emerging biomarkers in head and neck cancer in the era of genomics. Nat Rev Clin Oncol. 2015;12:11-26. Wang Y, et al. Detection of somatic mutations and HPV in the saliva and plasma of patients with head and neck squamous cell carcinomas. Sci Transl Med. 2015;7:293ra104. Hamakawa T, et al. Monitoring gastric cancer progression with circulating tumor DNA. Br J Cancer. 2015;112:352-356. Amberger JS, et al. OMIM.org: Online Mendelian Inheritance in Man (OMIM®), an online catalog of human genes and genetic disorders. Nucleic Acids Res. 2015;43:789-798. Forbes SA, et al. COSMIC: Exploring the world's knowledge of somatic mutations in human cancer. Nucleic Acids Res. 2015;43:805-811. Rothschild SI. Targeted therapies in non-small cell lung cancer-beyond EGFR and ALK. Cancers (Basel). 2015;7:930-949. Smalley KS, et al. CRAF inhibition induces apoptosis in melanoma cells with non-V600E BRAF mutations. Oncogene. 2009;28:85-94. Homet Moreno B, et al. Anti-programmed cell death protein-1/ligand-1 therapy in different cancers. Br J Cancer. 2015;112:1421-1427. Sparks AB, et al. Mutational analysis of the APC/beta-catenin/Tcf pathway in colorectal cancer. Cancer Res. 1998;58:1130-1134. Demunter A, et al. Loss of membranous expression of beta-catenin is associated with tumor progression in cutaneous melanoma and rarely caused by exon 3 mutations. Mod Pathol. 2002;15:454-461. Fang X, et al. β-Catenin overexpression is associated with gefitinib resistance in non-small cell lung cancer cells. Pulm Pharmacol Ther 2014;28:41-48. Nakayama S, et al. β-catenin contributes to lung tumor development induced by EGFR mutations. Cancer Res. 2014;74:5891-5902. Thress KS, et al. Acquired EGFR C797S mutation mediates resistance to AZD9291 in non-small cell lung cancer harboring EGFR T790M. Nat Med. 2015;21:560-572. Shah SP, et al. Mutation of FOXL2 in granulosa-cell tumors of the ovary. N Engl J Med. 2009;360:2719-2729. Fecteau RE, et al. GNAS mutations identify a set of right-sided, RAS mutant, villous colon cancers. PLoS One. 2014;9:e87966. Siravegna G, et al. Clonal evolution and resistance to EGFR blockade in the blood of colorectal cancer patients. Nat Med. 2015;21:795-801. Rodon J, et al. Phase I dose-escalation and dose-expansion study of buparlisib (BKM120), an oral pan-Class I PI3K inhibitor, in patients with advanced solid tumors. Invest New Drugs. 2014;32:670-681. Lin D. Detection of ALK rearrangements in non-small cell lung cancer (NSCLC) patients by liquid biopsy. J Thorac Oncol. 2017;12:S1862. Iiie M, et al. ALK-gene rearrangement: a comparitive analysis on circulating tumor cells and tumor tissue from patients with lung adenocarcinoma. Ann Oncol. 2012;23:2907-2913. Hofman P. ALK status assessment with liquid biopsies of lung cancer patients. Cancers (Basel). 2017;9:106.